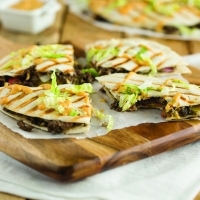 Nothing will get the family's attention like a cheeseburger quesadilla. Filled with all your favourite traditional burger toppings, this fun new way to eat a “cheeseburger” will surely have the kids asking for seconds. 2. In a large saucepan, brown mushrooms until moisture has been released, approximately 5 to 6 minutes. Add onion, beef and garlic, continuing to cook for 10 minutes or until beef is cooked through. 4. Place one tortilla in the bottom of a dry grill pan. Sprinkle with cheese, red onion, tomatoes and dill pickles. Spoon on meat mixture. Top with the second tortilla. If your grill pan comes with a panini press, place preheated press on top of tortilla. If no press is available, carefully flip the quesadilla over using a spatula. 5. Remove from skillet and cut into wedges. Top with fresh shredded lettuce and burger sauce and serve.